Safety in the shop is of utmost importance but it need not be at the expense of fashion. This gentleman woodworker has rolled up his sleeves while taking a blade to the grindstone, thus assuring said sleeves will not get caught in the work. His stance helps him approach the grindstone with control and finesse while helping avoid straining his lower back. The festive colors of the floor, motor housing, pedestal and grindstone cultivate a cheerful aura in the workplace. His snappy outfit reflects his aesthetic sense of design and helps “put him in the space” to do his best work. The color choices of said outfit were chosen to compliment the fixtures in his shop and complete the “ensemble” of his work environment. 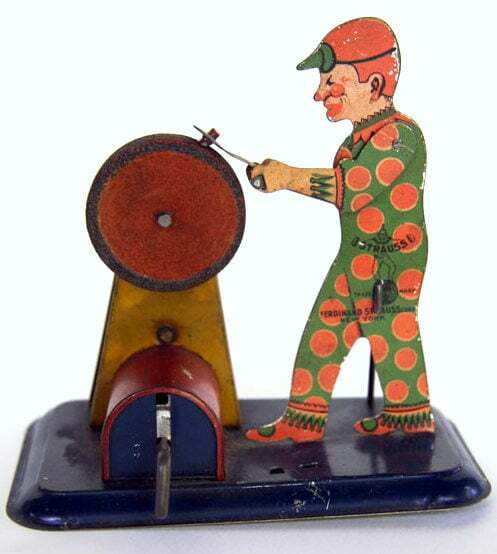 is the grindstone turning towards him or away from him? What bevel angle? is there a secondary bevel or a back bevel?